At the end of September the school community participated in activities to celebrate our founder’s ethos, working on projects across the estate in support of the school motto, ‘Work of Each for Weal of All’. The overall theme was the appreciation of nature, with activities ranging from foraging and bush-craft to falconry and poetry inspired by the outdoors. Other activities included tapestry weaving, lantern making and mural painting. The Whole School Effort transformed the area behind Steephurst, through the planting of an orchard of cherry trees. To mark the official opening of the Sam Banks Pavilion, Louise Banks and Keith Budge mounted an engraved school cricket bat on the wall of the pavilion whilst Graham Banks declared the building officially open. Read more. View photos of Badley Celebration Weekend. View photos of the opening of the Sam Banks Pavilion. 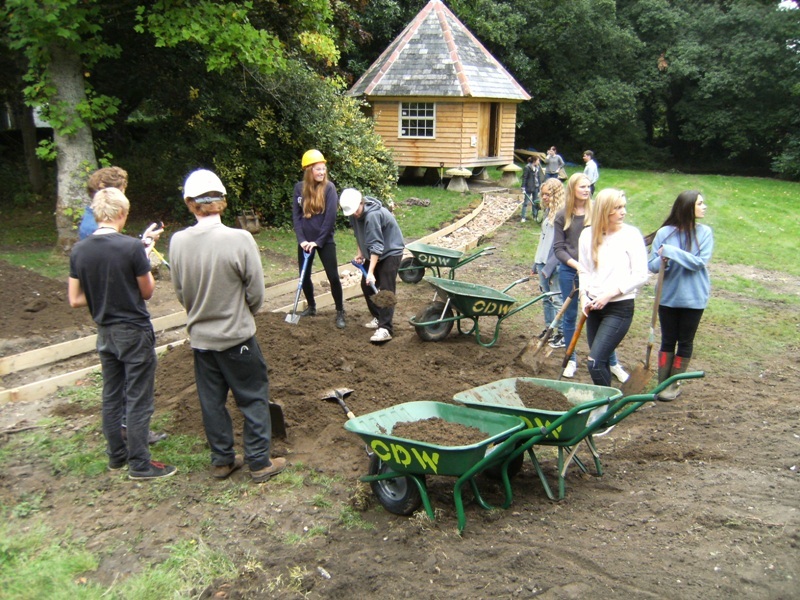 Outreach is an important part of life, both at Bedales and for OBs. Over the last year students have helped many charities, including Tools for Self Reliance, Stonepillow and schools in Swaziland. Watch a new Bedales Outreach film. Beyond Bedales, Poppy Wetherill (OB) who works for the British Red Cross is looking for people to sign up to either a breath taking cycle ride from Vietnam to Cambodia or a beautiful trek up Mount Kilimanjaro to raise vital funds for those who need it most. For more information, please email pwetherill@redcross.org.uk or visit the British Red Cross website. Olivia Yetman (OB) is also doing her bit for charity. Prior to veterinary training, Olivia is off to Okonjima in Namibia next month as part of her gap year to work with leopards, cheetahs and other Namibian wildlife at the Africat Foundation for five months. If you would like to find out more about her adventures, she is writing a blog about her visit. 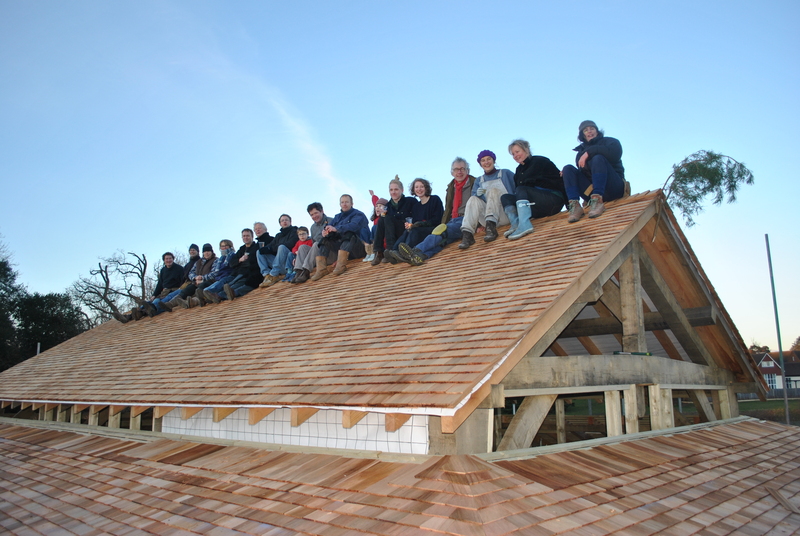 Last weekend saw members of the Bedales community, past and present, and relatives of the Banks family congregate to complete the final stages of roofing the Sam Banks Pavilion. OBs Gabriel Langlands and John Russell, who have been instrumental in designing and constructing the pavilion, shared the tasks of the exterior construction with friends and members of the school who will benefit in years to come. The highlight of the weekend was the ‘topping out’ ceremony, an ancient Scandinavian ritual to appease the spirits of the forest, which involves mounting an evergreen branch on the structure, in this case the roof gable, to symbolize growth and bring good luck to the building. The building is a culmination of fundraising efforts with significant contributions from the various efforts of parents, students and OBs. Read more. View photos.